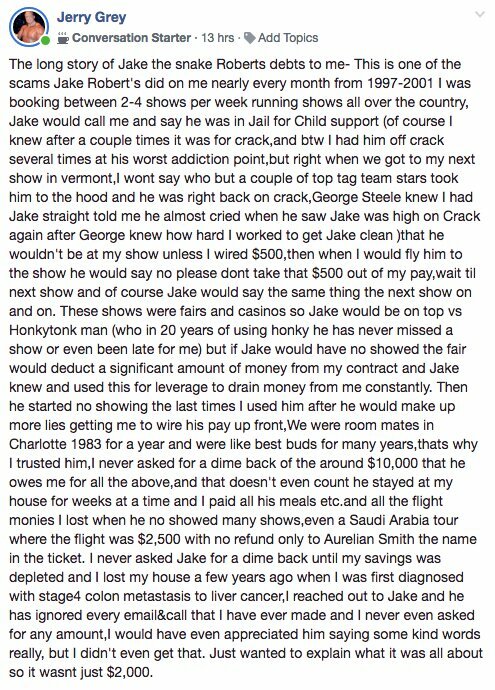 Jerry Grey, who booked shows for years recently jumped on Facebook to clear up some rumors about Jake Roberts. The long-standing version of the story is that Jake owes Grey around $2,000, but he had to clear it up by saying that the WWE Hall Of Famer owes him way more than that. In a lengthy message, Grey spoke about trying to get Jake Roberts clean and actually getting him off of crack cocaine a couple of times. Roberts would then find a way back to the drugs according to Grey. He said that Roberts would call him “nearly every month from 1997-2001” and say that he needed money to get out of jail or child support. Grey says he figured out eventually that the money was for crack. He also said that Roberts no-showed a tour of Saudi Arabia which Grey fronted $2,500 for the non-refundable plane ticket. Grey said that he and Jake were roommates in 1983 and friends for years after that. He put Roberts up for weeks at a time and fed him as well. Jake would no-show dates which would go to affect how much money Grey was bringing in. During the time of their relationship, he racked up a hefty bill of around $10,000 that Jerry Grey didn’t speak about until his own health started to decline. Grey said he lost his house and his saving due to liver cancer. Jake Roberts is doing much better now with the help of a clear head and DDP Yoga. However, he might still have some ground to cover when it comes to mending this relationship.